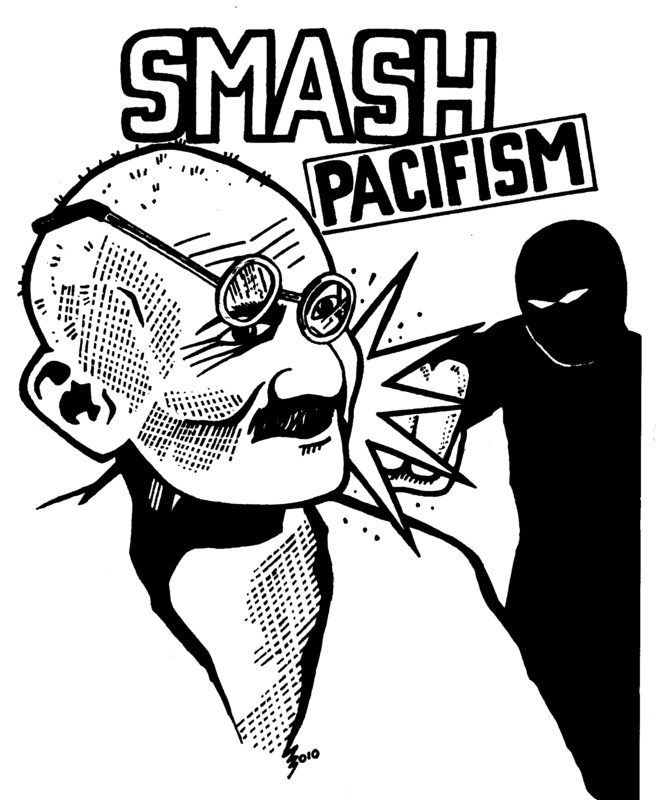 Smash Pacifism; A Critical Analysis of Gandhi and King is a 72 page, 8×11, zine critiquing pacifism and the legacies of Gandhi and Martin Luther King. Posted on November 13, 2012, in Documents and tagged black civil rights, civil rights, critique of pacifism, gandhi, Indian independence, martin luther king, nonviolent civil disobedience, pacifism, protest movements, resistance, smash pacifism. Bookmark the permalink. 7 Comments. True, but people are people. All societies are a mixed bunch, and I don’t think any culture is innocent. Pointing out that Indians had caste systems based on skin-color discrimination doesn’t make them an immoral culture. This seems to imply that pacifism is inherently incapable of radical social change and that violence, on the other hand, is. But if we follow the logic of the article, it actually says that India did have violent resistance movements. India wasn’t “liberated” by either violence or non-violence, it was “liberated” by the fact that Britain was economically crushed after the war and couldn’t rule a vast empire anymore – at least directly (hinting at economic imperialism). Speaking of India’s “liberation”, I’m pretty sure India isn’t any more liberated today than it was back then. It may not be ruled by White people, but the massive slums of Delhi, Calcutta, Mumbai, etc. (and the history behind their formation) and the powerful influence of corporations/foreign governments just goes to show that they’re still far from liberated. Vandana Shiva might have called them “Brown on the outside but White on the inside”. Plenty of Indians are still talking about “decolonization of the mind”; why? Because, as some would argue, the people in charge of India are just Indian people with the same minds as White people. Based on money, growth and greed. See: Schooling the World (documentary); Prevalence of Slums (book); Swaraj Foundation (decolonization of the mind). Thanks for the comment. I would disagree about cultures based on systematic oppression of another group of people not being “immoral.” I would not use such a judgmental term, and would perhaps simply describe such forms of social organization as inherently oppressive. One of the main points about India and the official narrative of the story is that, not only did pacifism not “liberate” India, it was actually the widespread violence and destruction of WW2, which so weakened the imperialist states that they had no choice but to withdraw from many of their colonies in the face of popular resistance. This resistance could perhaps be defined as “violent” but that is of course a mistake; all successful anti-colonial rebellions of the 20th century used a diversity of tactics. Can a strictly pacifist movement ever succeed in achieving real radical social change? It’s pure speculation, because there has never been a strictly pacifist social movement, and all the victories claimed by pacifists consisted of not only passive civil disobedience but also armed resistance. Of course, in no way was it implied that India’s “liberation” was anything other than a successful co-optation of the anti-colonial struggle and the imposing of neo-colonialism. But that is another matter entirely. I would disagree on the matter of caste based on color. It never was until India came under the British authority and the color of the skin started discrimination. If you are dark…you shall be suppressed and so started the fascination of Indians towards colors. No wonder you’ll find every Indian celebrity to be always fair in complexion. I’d also like to point out that history never spoke about religious separation. In the whole world, before the 18th century, you’ll never find any source where it said that people were divided on the basis of their religion. India is a prime example again. For centuries, Hindu population was successfully administered by foreign Muslim rulers and never did they had any conflicts, irrespective of how small or big or powerful or weak the kingdom maybe. Contrast the same when Britishers to India. It was marred by continuous [stiff] opposition for 200 years. WWs was the fight for resources. With powerful countries wanting to have the share of minerals and resources and the others not parting with it, culminated into a whole new sphere of fighting. I’d partly agree that India got independence right after the end of WW-2 and the movement for independence only got intensified during the preceding years of it. It was also about the timings of these civil disobedience and mass movements that played a major factor. Violence came at a much later stage, when the Indians became haste and developed the feeling of victory.